I want to start by stating that this is not the be-all-end-all of clownfish breeding guides. There are a lot of great guides out there. In fact, when I first started I used several of these “How to breed clownfish” type guides to build my foundation of clownfish breeding knowledge. So, if there are other guides out there, then why am I writing this, right? Well, what works for some may not work for others, and it never hurts to add new ideas or to spread ideas in a new voice. Finally, I wanted to write an all inclusive (or as much as I could reasonably include) guide to breeding clownfish to have all of the information in one place. I’ll also include as many resources as I can, such as where you can find additional information or products. So, with that said, here’s what has worked for me for breeding clownfish for the past several years. 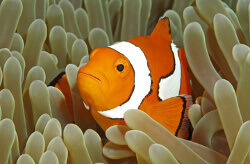 There are a variety of ways you can choose clownfish to breed. Some of the most obvious options include buying a pair of already breeding clownfish, buying a pair that’s bonded but not yet breeding, putting a smaller male fish with a larger, older female fish, or simply by putting a small pair of juvenile clownfish together and letting nature take its course. Not sure if you have a male or female clownfish? Check out this article on how to tell the difference between male and female clownfish. Benefits: The most clear benefit to this technique is the cost. It is typically inexpensive to buy juvenile fish, even designer ones, when compared to older, larger versions of similar fish. If you aren’t into designers, you can get baby Ocellaris or Percula clownfish for under $20. Juvenile designers will range from $50 to $200 plus, depending on the type, the source (the breeder) and what they look like. When purchasing two smaller fish to put together, it’s still a good idea to buy one that is larger than the other. Two fish of the same size may end up battling for dominance until one gets hurt. If they are different sizes then the larger of the two will quickly establish itself as the dominant fish and turn female. Drawbacks: If you want to see baby clownfish in your tanks within the next two years then this is definitely not the way to go. Female clownfish take years to become sexually mature, usually two years or more. Males on the other hand can begin breeding at around 6 months. Also, there usually is no guarantee that two small fish are both juveniles. There’s the chance you’ve chosen two females, in which case they’ll fight to the death. Sometimes, even during the pre-bonding process, two juvenile clownfish will fight until one is killed. Usually the roles of male/female will be worked out before this happens, but it is definitely a possibility. Benefits: In this case you would take a smaller juvenile or known male and put it with a large, established female clownfish. The cost in this case can be reasonable, although large females can be fairly expensive. It’s a good middle-of-the-road approach in terms of expense. You could also find a female that has bred before but is not currently breeding. Doing this will help speed things along, as they already have that instinct to pair up and lay eggs. Many breeders will call these “proven females” (or “proven males”). That basically means that the fish has laid eggs or fertilized them, taken care of the eggs, and produced healthy offspring. Drawbacks: There’s no guarantee that your female is going to accept the male that you’ve chosen. As much as you’d like to think you know best and have chosen the best possible mate, your attempts at creating a love connection may be futile! Sometimes the female will relentlessly chase the male until she kills him or worse, she’ll catch him and tear him apart. Yes, they can be quite brutal! I find that if you try to pair them up fairly quickly after acquiring the fish it will go better. If the female has been alone in her tank for a long time it will possibly be more difficult to pair her up. Sometimes you can trick the female by putting her in something like a bag or a bucket or some other container, along with the male, and keep them in the dark, so to speak, for several hours. If possible you can rearrange the tank or add some decoration or something. Then, introduce them back to the tank or to a breeding net or box and hopefully she’ll be much more amicable. Benefits: It’s usually just a matter of time that a bonded pair will start breeding. All that’s usually needed are the right conditions. More on the that later in the article. So what is a bonded pair? Consider a pair bonded if they sleep in the same area, don’t show aggression (except the normal female-keeping-the-male-in-line type nips), and basically are side-by-side or at least very near each other pretty much all the time. Drawbacks: It can be hard to tell if a pair is truly bonded in a short video or by taking someone’s word for it. If possible, check them out in person over a period of time. Anyone can easily stick two fish in a small tank, take a 30 second video of the fish cohabitating in the same space, and sell them as bonded. So be weary of unknown people selling “bonded” or “mated” pairs. A lot of people don’t really understand these terms and will place two fish together and call them bonded. As far as cost, this too can be pretty reasonable. Of course it’s usually more expensive than the previous methods, but sometimes you’ll be able to get a pair that’s been together for a long time in someone’s tank if they’re breaking down the tank or moving for instance. Benefits: The benefits of starting with breeding clownfish in the first place are quite obvious. You know the pair is sexually mature, that they’re fully bonded, and that they’ve bred. You can also often find out what the offspring may look like, if the previous owner raised any fry. Drawbacks: Breeding clownfish pairs can be quite expensive, especially if they are designers. Wild type clownfish breeding pairs can often be had for just a couple hundred dollars, but very nice Picasso clownfish can easily sell for $1000 or much more. Another potential drawback is that once the pair moves they won’t lay again. That’s right, just because they’ve laid in the past there is no guarantee that they’ll continue to lay after moving. Any time you break their cycle it can take time to get it back. Most of the time they’ll get back to it in a few weeks, but occasionally they’ll stop laying altogether. Just something to keep in mind. Also, be very cautious when spending a lot of money on breeding clownfish pairs. There are scammers out there who will take a video of fish tending to another pair’s nest and sell them as breeding. Why? Greed. Best to get video proof of them actually laying eggs whenever possible, or get to know your source very well. Once you’ve decided on your pair of clownfish, the next step may be getting them paired up. Of course this step can be skipped if you have a bonded pair or a breeding pair. For juvenile pairs of small clownfish, all that you need to do is put them together. As mentioned before even with juveniles it is best to start with two fish of different sizes. The larger of the two will be more dominant and turn to female and the smaller will fall in line and turn to a male. Then it’s just a matter of feeding them and keeping them happy until they’re old enough to breed. When the plan is to put a smaller fish with a larger female you do have to be a bit more careful. Large female clownfish can and will easily kill a juvenile fish if they don’t accept them as a pair. I’d always recommend to use a breeder net or breeder box to keep the pair separated but visible to each other for some time. Then let them be together in this confined space for a while to kick start the bonding process. You can find these on Amazon. Also, always introduce the female into the male’s tank, not the other way around. Anything you can do to take the female out of her domain will lessen the aggression a bit. Here’s a great video from one breeder, sharing how he pairs up his fish. Notice the size difference and the breeder’s box that they are in. Yes, sometimes you can put a female in with a potential mate and they’ll be totally fine, but not always. Plus, it’s possible that you put them together and they seem fine, only to find out after you walk away that the female decided she doesn’t like the male and kills him. Make sure the male has places he can hide if needed that the female can’t get into, such as 1 1/2″ PVC pipe or some rock work with small caves. Even then the juvenile won’t always know to hide and can quickly be killed. Bottom line, watch them closely! The bonding process can come fairly quickly, within a few days, or can take weeks. Sometimes it never happens and in this case you may have to try again with another juvenile or male. Once they’re paired up, how long will it take for your clownfish to breed? That depends on so many things it’s impossible to answer. I’ve introduced two fish and they began breeding within 6 months. Bonded pairs of clownfish may breed within a couple weeks and mated pairs have been known to breed in shipping! Now that you have your pair and they’re bonded, it’s time to start getting them ready to breed. Getting your fish ready to breed entails some distinct differences from normal clownfish care, but generally it is not super difficult and doesn’t require any extra equipment. There are a number of options for a breeding tank. First, you can let your clownfish breed right in your display tank. Yes, it happens quite often actually, usually taking the owner of the fish by surprise. So is it ideal? No. However, you can still have some success with this route (more on hatching the eggs and raising the larvae in a later article). So in this case, there’s no additional tank setup you need. Just good water quality, plenty of food, and some time. Another option, and in my opinion, the better option if you are serious about raising clownfish, is to set up a tank just for breeding clownfish. It doesn’t need to be elaborate or super expensive, and saves you from having to collect larvae from your display tank. For ocellaris and percula clownfish, a ten gallon glass tank is more than enough. Some people will even split a ten gallon tank into 2 five gallons tanks by adding a divider. Maroon clownfish should be in at least a ten gallon tank, twenty would be even better. Once the fish are bonded and ready to breed, they’ll hardly leave their pot or tile so they don’t need a lot of swimming room like many other reef fish would. With that said, it wouldn’t hurt to go bigger, it may just be wasted space. If at all possible you should set up your breeding tank with a sump. Here you can put your heater, skimmer, return pump, etc. Having the added volume of water makes it easier to keep clean and maintain water parameters as well. Filtration options with the sump are wide open. I prefer simply using reef rock (live rock), although that’s just a matter of preference. More advanced forms of filtration will work, whatever you are familiar with or comfortable with. A good skimmer is quite important, as is a stable heater. Inside the main part of the tank you don’t really need a whole lot. I recommend a bare bottom for the tank and not having any live rock, corals, anemones or anything else in the tank except a clay pot or tile cave. The clay pots are really just planting pots that you can buy at any hardware or lawn and garden store like Home Depot. I use the 4″ pots for both ocellaris and perculas and they work just fine. I rinse them really well and they’re ready to go. Some people recommend soaking the pots in reverse osmosis water to remove any potential contaminants, which isn’t a bad idea, but I’ve never done it and have never had any issues. Tiles can be 4 or 6 inch (or larger if you prefer) tiles that you also get from the home improvement store. Just make sure they aren’t treated with anything (most are not). You can build triangles or squares for them to call home and you can use aquarium silicone to keep them together if needed. Be careful of just placing the tiles on top of each other and hoping their own weight will keep them in place. Clownfish will move things around biting and cleaning the surface and the last thing you want is for a clownfish to be trapped or your eggs crushed. For me, pots have always worked well and they were easier to set up and maintain, but again, that’s just a preference. Feel free to experiment and see what works for you. When you want your clownfish to breed, you need to feed them. A lot. You probably couldn’t really feed them too often, just make sure that when you do feed them, they eat what you’ve put in the tank. One huge meal will not make up for not being around the rest of the day. Yes it can be a pain, but be creative with your schedule. Try to feed them at least 3 times a day, 4 is better. A lot of people want to know what is the best food for getting your fish ready to breed. Ask that question and you’ll get a lot of different answers. I think the best answer is as wide a variety as you can reasonably offer. I mix foods throughout the day, using dried pellets, frozen foods, and sometimes even some fresh foods. For pellets I’ve used TDO from Reed Mariculture (I prefer the small size), Ultra Marin Soft Clownfish pellets, Marine A pellets from Hikari, New Life Spectrum, Cobalt Breeders Formula, and Ocean Nutrition Formula Two pellets. You don’t need to use all of these, just mix it up a bit. If I had to choose two and only two, I’d probably go with TDO from Reed and Formula Two pellets. Again, good quality foods like LRS and Rod’s Food are worth the money if you plan on breeding. They’re cleaner and both offer a blend specifically for breeders. Some people like to blend their own foods and freeze it for their breeding pairs. I’ve never done this so I can’t give a lot of information about it. I do know that fresh fish such as salmon are a popular ingredient and make up the bulk of the food, along with several other options like shrimp, squid, seaweed, etc. If this is something you are interested in I’d suggest looking around on forums or Facebook, or just experiment for yourself. Finally, I mentioned live foods. I’ve offered my fish live earthworms. Some fish love them and some get freaked out, so even if they don’t eat them you get a little entertainment! Just kidding of course, but they’re easy to collect, especially after a rain. Just look for the small one, bite size for a clownfish and rinse them first. Also be sure to remove any that they don’t eat. Blackworms are another possibility although I’ve never tried it. You usually have to order them online and you can keep them in the fridge until you’re ready to feed your fish. You can also culture your own blackworms. Brine or mysis shrimp are a common live food for clownfish too. Some pet stores carry them for food while other people hatch them and culture them on their own. Clownfish will also eat copepods and amphipods. One of the more unusual live items I’ve offered my clownfish is mosquito larvae. While I definitely would not recommend raising mosquito larvae (unless you are going to make sure they’re all dead before they metamorphose into mosquitoes), I will say that my clownfish love them. I’ve never had one turn away from them. They’re easy to find any time it’s warm outside. Just look for standing water. You can net them out, rinse them and put them in with your fish. I only fed a few at a time because they won’t live very long in salt water. However, they do live long enough to swim around and be incredibly enticing to clownfish. In general, the water conditions should be as pristine as possible. Regular water changes will help, as you’ll be feeding a lot and you may have a smaller water volume if you aren’t using your display tank as the breeding tank. I keep the specific gravity a bit lower than you would on a reef tank, at about 1.022. I also keep the temperature higher than a normal tank, at 83. Everything else is pretty much standard. You should have 0 ammonia and everything else should be kept in check by water changes. Your nitrates may be a bit high, just don’t let it get out of hand. This, combined with the warmer temperature, leads to faster and more robust algae growth. I don’t mind some algae, just again, don’t let it get out of hand. Most of the time the only thing needed to get your clownfish to breed is patience. If you’ve given your fish everything they need in terms of clean water, plenty of quality food and their own space to mate, then there’s not much more you can do. There are a few tricks that breeders use that have worked for me personally, so I’ll share those. One is to turn the heat up in the tank a bit for a few days or a week or two. You can’t raise it too much, but 84 or 85 would be fine for a short period. This will often trigger the natural instinct to breed. Another trick is to provide them with lots of live food. Live brine shrimp and live mosquito larvae have both worked for me. You need to do this fairly regularly for a few days, then wait and see what happens. The last one is a technique that I’ve used successfully to coax a pair to breed and I know that many other breeders have done the same. If you take eggs from another pair and place it with the pair you want to breed, they will usually tend to the eggs as if they are their own. Then, if they are ready to breed, they’ll usually begin spawning within a few weeks after the eggs hatch. You may have to do it a couple times to get it working, but this one usually works as long as the conditions are right for them to breed. Obviously not everyone has extra clownfish eggs laying around, but if you know someone else who’s breeding clowns, perhaps you can borrow a pot full of eggs from them. Again, these aren’t magic tricks that will guarantee that your clownfish will breed, but they have been known to work. Now that you know how to get your clownfish to breed, you’ll want to read our article on raising clownfish babies from eggs.